I saw this floating around Facebook yesterday and had a solid geek-out. 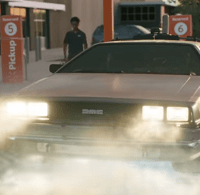 I’m not sure exactly what it is about pop culture nods that get me so jazzed, but this new spot from Wal-Mart promoting their new grocery pick up is full of references. How many of these famous cars can you recognize! ?